You know when you land in someone’s dream, not only by the way they treat you, but by the way everything around you is so thoughtfully presented. 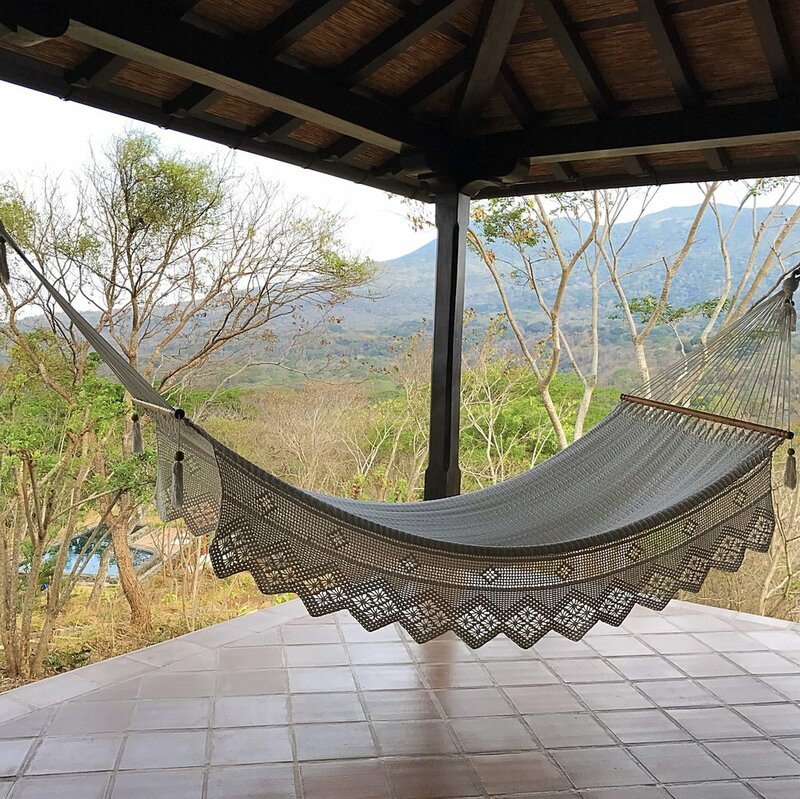 I landed in Emi and Romain’s dream at El Respiro Ecolodge in Granada, Nicaragua, and it was indeed a deep, deep beautiful and dreamy breath of fresh air. Respiro means “breath” or “break” in Spanish, and this three-room ecolodge was my grand finale and a well-deserved break from a month of travel in Central America. Located close enough to Lake Nicaragua to feel its breath, and minutes from Granada to still feel connected to the hustle, El Respiro offers a view of the Mombacho volcano at the top of a hill 350 meters above sea level that stops you in your tracks. The lodge is surrounded by nature reserve as far as you can see in all directions. Romain and Emi, the French-Hungarian restaurateur couple that dreamed up El Respiro, live and work in their dream every day. Romain is the chef for the property, creating daily menus from the organic produce that has been growing on their 9 acres of land since early 2013. Emi, Ilan their son and little prince of the lodge along with their house dog Leo and cat Rocco complete the staff of this intimate stay. It is a family affair. There are three rooms in the lodge with common gathering spaces that invite you to feel like you are home. My room, “The Suite”, was a spacious 66 square meters space with tall ceilings, a king size canopy bed, walk-in closet, sitting area and spa-like bathroom. But the best part of staying in The Suite is the view; located on the second floor, The Suite is wrapped with windows for a panoramic view of the outside jungle. It felt like I was in a tree house, and it sounded like one too. I was serenaded each night by the sounds of the jungle, and my natural alarm each morning was the howl of monkeys nearby. Every sunrise and sunset was picturesque. Every meal is prepared fresh by Romain’s hand. The night that I was there I shared the dining room table with another guest staying in the downstairs room, she was there after her yoga retreat. Romain and Emi join guests for dinner and this adds to the welcoming and intimate feel of El Respiro. We enjoyed a vegan meal of couscous, fresh, seasonal vegetables and chia pudding with apricots. The conversation was about travel adventures and the details of Emi and Romain’s dream and how they work daily to keep it alive. They have plans to expand on their land in the coming months. Breakfast is served al fresco each morning with fresh, local coffee, juice, coconut water, toast, fruits and daily inspiration from Romain. The moving that is done on and near El Respiro is slow and deliberate. The stone pool with pergola and sun deck offers a refreshing contrast to the jungle temperature and a great spot to relax with a juice and a book. The locally handcrafted hammock on the porch called to me each afternoon. The little farm on the property is a great place to visit and a short walk from the lodge. This farm hosts vegetable crops of Oxheart Tomato, lettuce, local zucchini, radish, peppers and cassava along with other seasonal offerings. There are 200 cacao trees, 100 coffee trees, and hundreds of lemon, orange and tangerine trees on the property. The farm is also the home of chickens, ducks, pigs, and rabbits that are fed well with organic grains and fruits. Emi and Romain also have a beehive of jicotes, indigenous bees whose honey is known for it’s therapeutic properties. There are many activities to do nearby, with lots of neighboring towns including the “White Towns,” where many authentic Nicaraguan crafts are handmade. The Miravalles Canopy Tour is only ten minutes from the lodge with 11 zip lines and 17 platforms for the most adventurous guests. Both Agrias Natural Springs and Laguna de Apoyo are very close, only 30 minutes from El Respiro. These springs have crystal clear warm water and are unique to the area. And, if you wish to explore horseback, Emi and Romain can help you organize a 1.5-3 hour ride that will take you from Granada to Catarina. The views from this tour are magnificent. El Respiro is easy to get to from the Granada Airport, it’s a short drive to a deep, fresh breath of air and big break from the outside world. When you arrive, it feels like you are home. Home with Emi, Romain little Ilan and their happy animals on the hilltop in the middle of the Nicaraguan jungle – in the middle of a dream! My most favorite places in the whole world have come to me by invitation, and Mukul Resort was no exception. This gift of a secret hideaway, and very special invitation, was the ultimate luxury experience, and my time spent there will always be on my favorites list. Located in Guacalito de la Isla, Nicaragua, Mukul Resort is easily accessed via the Daniel Oduber Quirós International Airport (LIR) or the Augusto C. Sandino International Airport (MGA). From these airports, a quick and easy flight into the Emerald Coast International Airport (ECI) will find you just 15 minutes from the resort. Despite the ease of getting there, and the recent Conde Nast press, Mukul Resort still remains (and feels like) a secret. I was struck instantly by the grandeur of the immaculate property, and even more put-together staff and impeccable details. From the moment I arrived at ECI, until I was carefully placed in my private car to MGA, I was taken care of in the most thoughtful and beautiful ways. Hospitality at Mukul feels intimate, because it is. And, great lengths are taken for this detail to come across in every single thing that they do. I was welcomed by Betsy, one of the concierge, with a warm, genuine smile that made me feel like family, and an ice-cold welcome drink served in a hand-carved cup - and then I walked into the postcard and pinched myself around every corner for days, until I left. The postcard looked and felt like someone's dream, because it is. Don Carlos Pellas' dream to be exact. His family came to Nicaragua in 1875, he is fifth generation, and named one of the 50 most influential people in Latin America by America Economia. Smilton became my favorite ambassador, every single member of the staff is required to speak English, and the care they took to eagerly and honestly engage with me each time there was a chance was not lost on me. I was shown to my room and given the details of my private bohio which is carefully placed high above the beach for an incredible view, far enough away to feel the right amount of solitude, but close enough to feel connected - a theme that stayed with me the entire time. Once Smilton felt like the bohio was mine he looked at me and smiled and asked me when I would like my cookies, milk and coffee delivered in the morning. The 7am delivery, each morning of my stay, was a gift that set the tone for the entire day. I shared my private outdoor space with two very eager-to-be-my-friend Magpie Bluejays, a curious raccoon who left wet tracks near each door every morning, and the usual parade of geckos and other desert/jungle creatures. But my favorite creature that shared its home with me was the butterfly. They danced, and fluttered and became the perfect reminder to take deep breaths, breathing it all in. The invitation to "feel like you are the only person on earth" is articulated in the design of the Mukul Resort experience in many ways. My bohio, a free-standing suite and one of 37 rooms, felt like a cocoon at night when I returned home from dinner to find the turn down service included pulling all of the floor to ceiling drapes closed around the entire room blocking the outside world out. Hearing the ocean from my bed was a nice contrast to the swaddling effect of the room. This theme continued for me as I took full advantage of my private ocean view plunge pool with daily skinny dipping sessions, air drying in the sun that felt like it was shining just for me. I never felt the need to leave the property, and actually I'd still be there if I could. On the second day of my stay I toured the six spa temples at the resort, yes six. The temples, each one with its own theme, inspiration and sequence of treatment experiences, are available privately for three hours at a time or for full or half days. The Ancient Sanctuary, Crystal Temple, Hammam, Healing Hut, Rainforest, and Secret Garden are each unique experiences in lavishly designed space. I loved the private bubble bath experience in the Crystal Temple and the Ghassoul body, face and hair mask of Moroccan volcanic clay followed by a mist of floral rose water and Argan oil massage in the Hammam Turkish and Moorish temple. The stretch of beach hosting Mukul Resort is idyllic and each wave more perfect than the last. This is where you feel the epic nature of this hidden place, and "make an authentic connection to the land," because they are married so perfectly. All of this by design with Pellas' dream in mind. On my last night I dined solo on the main beach as I watched the sun paint the sky with Nicaraguan pastels. I will never forget this dinner. We move so fast, and we worry, and question things and spend so much time thinking about minutes passed, or the next minutes to come. As I watched the color of the world change both all at once and ever so slowly, I felt like I was the only person on the planet, and in that moment I felt the most incredible peace that this was absolutely enough. That I was absolutely enough.